Lovely late 1800' s cottage .Old New Orleans charm in a great location! Come chill in the sitting pool!! This private house has one private bedroom and a comfortable fold out sofa in the living room. There is a nice size kitchen , with a cozy gas fireplace. It opens on to a gorgeous courtyard with a sitting pool. All new renovation , but old world charm remains. It is in a great location .. Within walking distance to the Marigny, Bywater and the French Quarter. There are a variety of bars, restaurants and coffee shops near by. Best of all, the St. Roch Market is just steps away! toilet, combination tub/shower, Nice ! Clean ..
Well working window units ..
2 sided gas logs .. Opens into kitchen and living area..
Street parking easily available ..
Deluxe large cotton bath towels..
With queen size comfy fold out couch and gas fireplace..
Ice and water on door. Coffee , tea , salt, pepper .. There is a nice gate leg table and chairs that easily seats 4. There is also an outdoor table and chairs that is good for dining or appetizers by 'the pool'. 2 Flat screen . Cable. Dock for playing music from phone , tablet or laptop. 25% discount on bike rental at Confederacy of Cruisers. New Orleans is ideal for biking around town.. Lots to see and do and no hills! Small Beautiful sitting and cooling pool. A comfy, well-appointed tiny house. The location is very desirable—out of the hubub but a just few minutes to downtown. The neighborhood is friendly with plenty of safe, on-street parking. A cold front with drenching sheets of rain showed up while we were there, and the little through-room gas fireplace made it a cozy and fun respite—so much more so than a souless hotel room would have been. When the sun came out there was a beautiful, “vest pocket” shared courtyard with a stone crystal clear pool deep enough to get into. An occasional foghorn out on the river in the distance and the trickling water sounds from the fountain in the courtyard makes this little gem a very romantic get away! A must stay venue. Fabulous VRBO. We’ll be back. Super hosts! Very accommodating. My wife and I spent seven wonderful days enjoying many of the fabulous sites and events in New Orleans . Fortunately for us we chose to stay at Ann & Tom’s very cool “Black House”. Excellent instruction were given. Snacks on the kitchen counter and beer, milk and sodas in the refrigerator. Coffee in the cabinet. We had beers with them at their favorite local tavern “Marie’s” a couple of blocks down the street. Terrific gumbo served there. All in all a wonderful time. Highly recommended. Best restaurant food and ambieance for us. “ Cochon”. Located near World War 2 Museum. An absolute must see museum. Oh! Back to the property... The back door leading from the bedroom places you and two very delightful garden areas which include tables for dining. We enjoyed our breakfast and drinks there are numerous occasions. It was great meeting both of you and we are delighted that you enjoyed your visit so much! Sweet little house in the perfect location! The accommodations were everything we could ask for, plenty of towels, Crabtree and Evelyn Toiletries, local beer and snacks left for guest, the only thing I wish we had was an extra blanket because it got a little chilly at night. The garden is absolutely charming, and the location was great for us, a quick walk into the French Quarter, a couple blocks from a street car pickup. While the exterior is cute, and the interior walls had been painted not too long ago and there was an updated kitchen, the bed and sofa sleeper were quite uncomfortable. The sofa sleeper smelled. The entire place is in need of a deep cleaning. There was built up dirt/dust under both the bed and sofa sleeper, the shower curtain liner was quite dirty (replaced during our stay at our request), the mopboards needed to be scrubbed and the fireplace did not reliably function. It was quite chilly during our week long stay and these shotgun houses are not insulated. We used the kitchen oven for heat. Since the owner lives next door, it would seem there could easily be some kind of cleaning quality control checks between guests. The owners did respond to text messages. Suggest a light be added above the kitchen sink and perhaps some better storage for toiletries/towels be added to the bathroom. A little shelf in the corner would be better than 1 square foot of surface. The location is about a 20 minute walk to the French Quarter, about 4 blocks from a trolley stop and the nearby St. Roch market (1/2 block away) was a fantastic place to get a variety of excellent food. A food co-op and grocery store are located a few blocks away. The neighborhood is gritty, like much of New Orleans and there is a tavern/bar nearby, so sometimes noisy. Communication was always outstanding. Place was located close enough to the square that we mostly walked everywhere we went. Very quaint and well decorated. There really isn't anything I can say was bad about this place, the bed was probably a little too soft for our comfort but was very very nice with enough pillows and extras in the closet if needed, I think the comfort of the bed is more on a personal preference than an actual downfall. I would definitely rent there again if I the area. 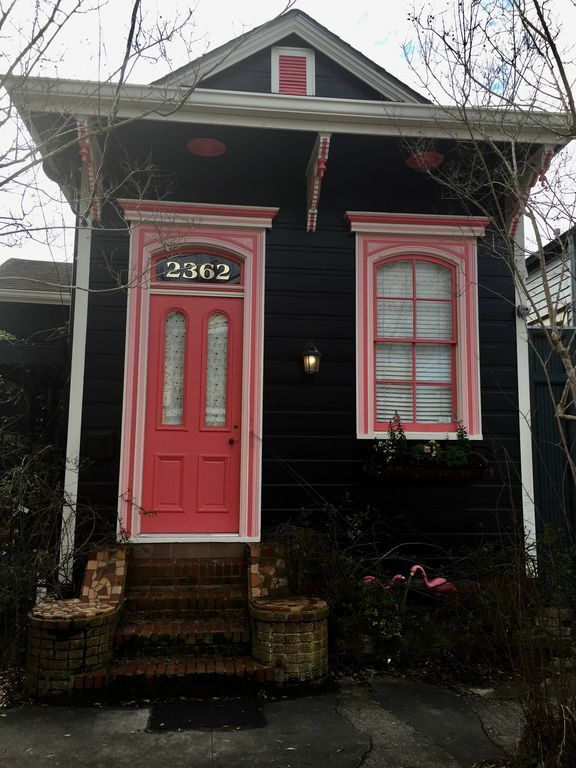 This adorable cottage is within walking distance to the Marigny , Bywater, Frenchman Street and the French Quarter. There are a number of neighborhood bars in easy walking distance, some of which also serve food, such as Arabella Casa di Pasta (at Cajun's) and Kukhnya (at Siberia), and the famous St. Roch market is right around the corner! (See last 2 pictures) The Spotted Cat restaurant is one block away, located in the New Orleans Healing Center which houses the New Orleans food co-op, a health club ($15 for one day pass, less for multiples) yoga studio ($17 for one day pass), and other shops.... just three short blocks to Marie's Bar (one of New Orleans finest bloody Mary's ) and a short walk to Mimi's, Feelings Cafe, Faubourg Wines and several cool coffee shops, to mention a few things. The new Roberts grocery market is just 4 blocks away , across the street fro the St Claude street car stop . The cottage is newly beautifully renovated. It is a true New Orleans beauty with all modern amenities.. There are high ceilings , ceiling fans and hard wood floors. Stainless steel appliances, granite countertops . The is a fabulously comfy pillow top mattress , flat screen tv's, cable and wireless internet. There is a gas fireplace and the cottage opens onto a beautiful serene court yard with a lovely 'cocktail' pool .. Great for sitting, relaxing and cooling off . Washer and dryer on premises . This cottage is cozy .. The bedroom is separate and private.. ( not a 'shotgun') . There is a queen size bed and a big window and a closet.. In the living room there is a nice queen size fold out couch with a thick mattress and springs. Rates start at $175.00 per night. Rates vary by season and special events. Contact owner for price quotes .